Grew Up… as a soldier during the Indian Wars in the United States. He participated in massive massacres of native men, women, and children. He is still haunted by the horrible, bloody memories. Living… a painful existence in the year 1876. Nathan’s a dedicated alcoholic, who drinks “to forget” his memories of the Indian massacres he helped lead. Ironically, he finances his booze habit by performing glorified, theatrical reimagining’s of battles against Native Americans. Fortunately, he’s finally been given the chance to put some distance between himself and his past when he is approached by an old colleague with a job offer: all Nathan has to do is go to Japan and train the newly industrialized Imperial Japanese Army. 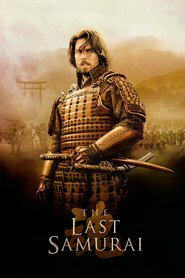 Sounds simple enough, but the job turns out to be a lot more complicated when it’s revealed that a rebel group of traditional samurai warriors led by a samurai named Katsumoto are hell-bent on halting the industrialization that will eradicate their ancient warrior culture. Interests… alcohol. Nathan has spent much of the past few decades chronically disinterested, trying to interact with the world as little as possible. He works as a soldier because that’s what he knows how to do, and that’s what gives him enough money to keep on drinking. But that’s all starting to change now that he’s in Japan. Nathan is growing increasingly comfortable and interested in Japanese culture, believing he may have finally found a place to call home – and perhaps a chance for redemption. Relationship Status… single. Though he is in a dedicated relationship with alcohol. Nathan sees himself as a killer, and has no interest in poisoning someone else’s existence. Challenge… overcoming his haunted past. Nathan’s role in the Indian massacres took an incalculable toll on him, leaving him a hollow shell of the man he could have been. When he is captured by the samurai rebellion, he is given a unique chance to prevent a similar massacre and cultural destruction – offering a sense of redemption that might allow Nathan to finally claim some measure of peace. Katsumoto may technically be holding him captive, but Nathan is learning a great deal from him. Personality… self-loathing and disrespectful, at least until recently. Nathan is seemingly numb to the world and its problems. However, in the peace of the samurai village, he slowly begins to reveal the kind of man he could be if he wasn’t shattered by guilt. Intelligent, courageous, and desperate to believe in something bigger than himself, the cynical Nathan is at a turning point – one that will either end in him reclaiming his lost honor, or condemn him to languish in whiskey and self-pity for the rest of his days. Nathan Algren's popularity ranking on CharacTour is #2420 out of 5,000+ characters. See our top-ranked characters and read their profiles.